You can make Linux sound better with a little Wine. Run Linux on top of Linux? It makes sense. Really. Can a free virtual system offer what you need? Xen's unusual approach to virtual systems can give it a speed edge. 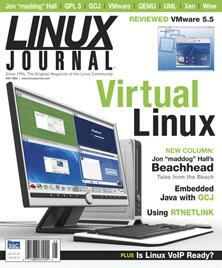 GCJ may not be for end-user applications, but it's the bomb for embedded systems. What are the viable VoIP options for Linux and how do they compare? Socket to me with the RTNETLINK kernel interface. Want to avoid common pitfalls when getting started with PHP?